Facebook has been under fire for the past several months as Zuck does his World Apology Tour, both in DC and in Belgium giving testimony to the EU Parliament. That link takes you to a YouTube video from The Verge which shows him not answering very pointed questions from the body’s members. The EU format was very different from his US Congressional testimony in April: In Europe, the session was just an hour and a half, with much of that time taken up by Members’ speeches. In the States, he was there for a total of ten hours. Business Insider called the EU appearance “a wash out.” That difference between the two geographies was noted by lawmakers quoted in Vox. “We are here in terms of regulation,” said Claude Moraes of the British Labour Party, gesturing upward with one hand, “And the United States is here,” gesturing downward with the other. Sadly, the social media giant has paid lip service in protecting users’ privacy. There is this story in the NY Times about how it cooperated with the major cellphone vendors to give them access to vast amounts of private user data. And the company hasn’t done very well towards policing its content for terrorist and hate speech. This recent post in the UK’s Independent talks about the effort that the vendor is going to try to block hate speech in Germany. The reporter takes us inside a 1200-person cubicle farm where analysts try to screen content in real time. 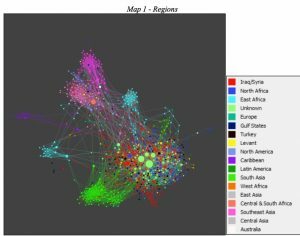 The authors selected a thousand Facebook accounts that they claim are ISIS supporters, using positive language and geolocation to specific areas, usernames with pro-ISIS meaning, accounts from people that claimed they worked at ISIS or are from place names that are under ISIS control. You would expect many of these accounts to originate from the Middle East, but there also were accounts from Nepal, South Korea and South America too: ISIS has truly gone global. There were even American accounts. They examined each account’s timeline and pattern of liking and sharing posts and then recorded the number of their friends or followers and other data. 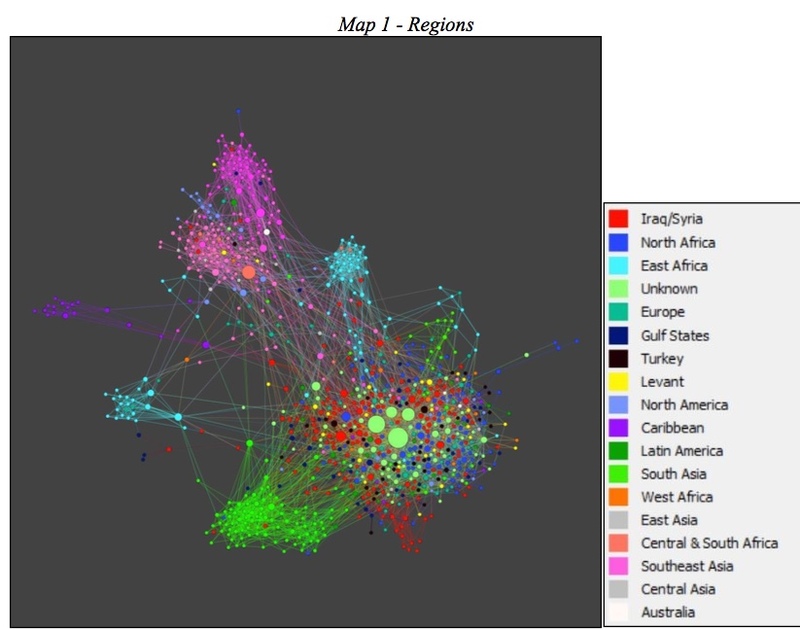 They then visualized this data using the open source network path analysis tool Gephi. While I am not an expert here, it seems their methodology is sound. They found many disturbing things. There were 28 accounts that were used exclusively to post pro-ISIS propaganda, with some posts that have remained online for more than a year and racked up thousands of views. Also, “a group of American ISIS supporters holds weekly meetings on Facebook Live to discuss topics ranging from ISIS ideology to how to avoid detection from the FBI.” ISIS supporters live in more than 80 different countries. Most supporters had publicly visible posts, too. Facebook says they have worked hard to try to stem this pro-ISIS tide, but the CEP report documents how they have mislead the public and been largely ineffective. The report says that Facebook has been unable to do anything “in a manner that is comprehensive, consistent, and transparent.” Rather, it has enabled ISIS supporters to flourish and grow their social networks. Of the 1,000 accounts analyzed, less than half of them had been removed by Facebook by March 2018, and many accounts were reinstated multiple times after removal. “Perhaps most concerning is that Facebook’s suggested friends algorithm reveals how the company’s tools have aided in connecting extremist profiles and help expand ISIS networks.” The report goes further and says that Facebook executives have purposely misled policymakers and the public in terms of their cleansing of their network from pro-ISIS activities. The post in New Europe was quite disparaging and called Zuck’s non-answers before the EU evasive and a disaster. It mentions his claim that Facebook “can flag 99 percent of the ISIS and al-Qaeda related content that we end up taking down before any person in our community flags that for us.” Clearly, that number (apart from being meaningless) is at odds with the CEP report. One final personal note about Facebook’s inadequacies. Two months ago, I tried to download information from Facebook and other Internet sites that they have collected about my usage, and documented the experience in my blog here. It wasn’t an easy exercise, but it was sobering to see how many advertisers had my name in their sights, and in their sites as well. None of the Internet properties make this easy for you to do, but the effort is worthwhile and another eye-opener.